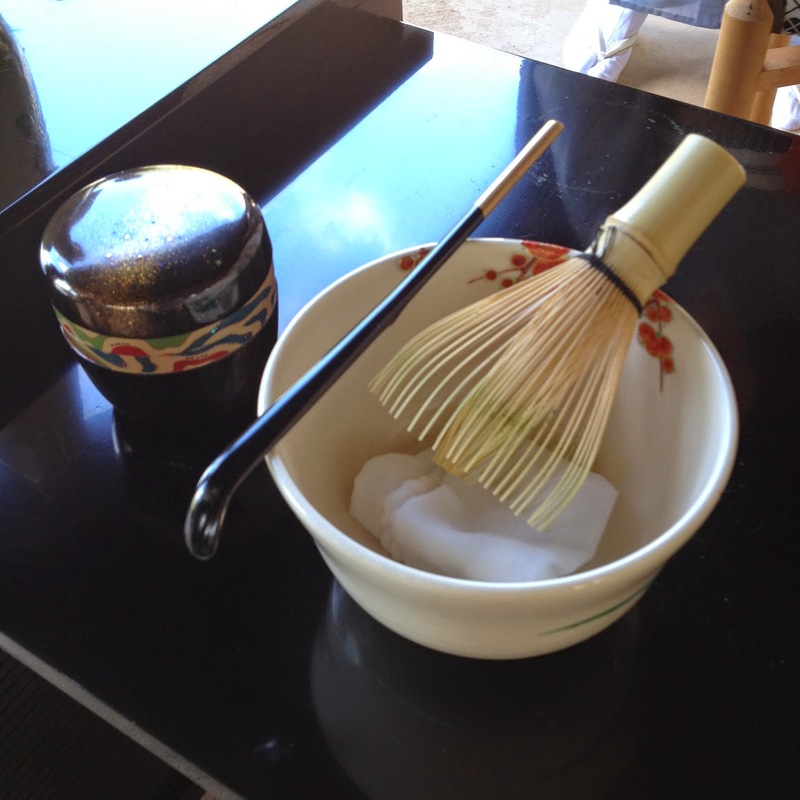 Recently, I had a chance to attend a Japanese tea ceremony at the Rinzai Zen Mission, an Okinawan mission in Paia. Yukie, a Japanese friend who's lived on Maui for years, invited me, and I debated going, but thought I would try to be open-minded. The ceremony was a Hatsudate Ceremony, the first Japanese tea ceremony of the new year. It was free and open to the public. 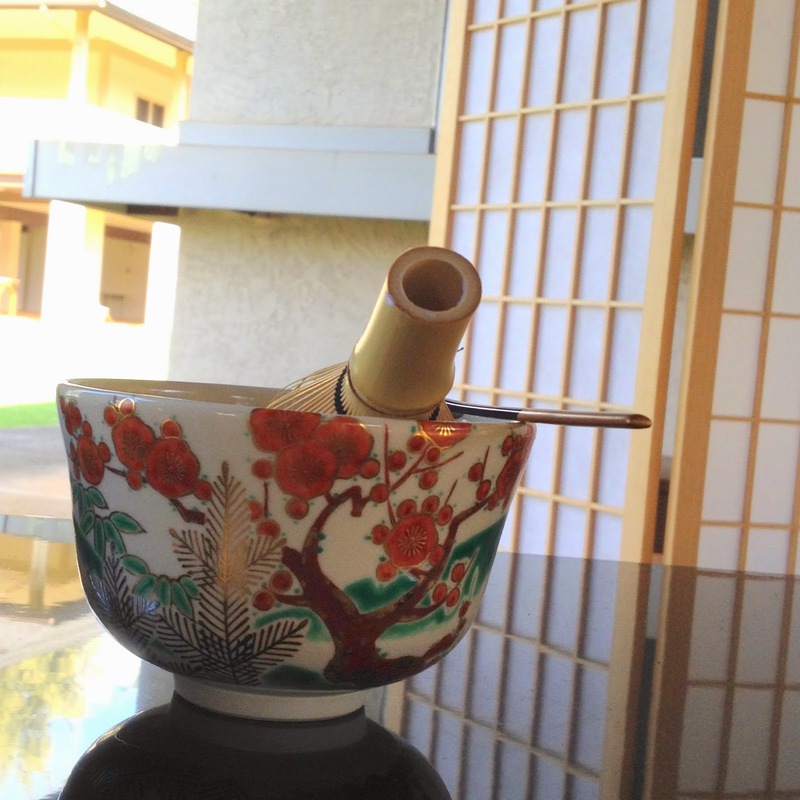 The tea ceremony was presented by the Chado Urasenke Tankokai Maui Association. They hold the first tea ceremony of the year, usually on a Sunday in early January, and it's open to the public. The tea ceremony was performed in front of a mixed audience of all ages. Some people were Japanese or Asian, but there were quite a few Caucasians as well. Confession: I thought I would be very bored. My idea of Japanese tea ceremonies is that every movement is supposed to be very precise and scripted, with a certain way of holding the whisk, a certain way of adding tea to the bowl, a certain way of whisking the tea, and then setting the whisk down, and then holding the tea, and so forth and so on. I was concerned I would fall asleep during the ceremony and embarrass myself by falling out of the chair. Rinzai Zen Mission in Paia, next to Baldwin Beach Park. To get to the mission, one actually has to drive into the beach park as if going to the beach, continue past the parking lots and then turn to the driveway to the mission on the far right. The red structure has a bell or gong. shoji screen to the right of the tea ceremony. 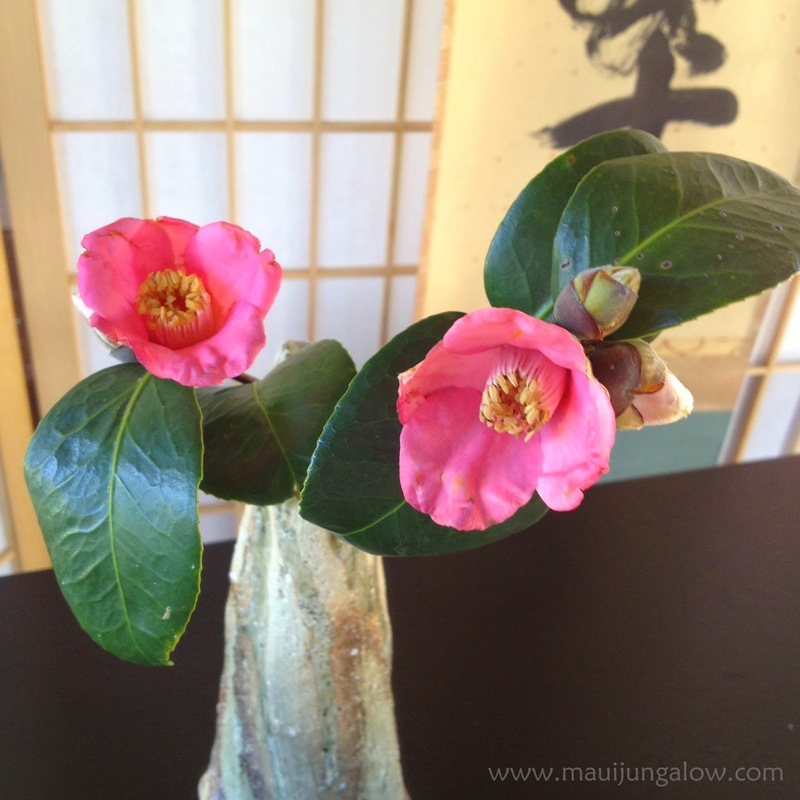 The camellias are not the showy ones with multiple petals. The vase that holds the flowers is handmade and not smooth, embodying perhaps the quality of "wabi sabi" (handmade, imperfect, transient, the opposite of sleek) that is valued in Japanese culture. The person next to me said that different flowers are used at different times of the year and that the flower arrangement was deliberately asymmetrical. I thought this was a really beautiful arrangement. The tea ceremony turned out to be very pleasant and oddly refreshing. I don’t know if it is because the structure gives meaning, or if there is a particular organized mindset in hosting a tea ceremony that imparts a sense of peace to the event. When DH and I got there, I was kind of agitated. It was one of those awkward days when things aren’t going very smoothly. The whisk is made of bamboo and is very finely made. All the utensils and materials seemed to be placed with plenty of room around each item. Some utensils used in the Japanese tea ceremony. After we left, I was very relaxed but very awake. The ceremony was about an hour, and we even arrived 15 minutes late, and it was not a big deal. People showed us the empty chairs up front. DH said that in Japan being tardy to a tea ceremony is probably a very big deal, but on Maui, it’s relaxed. The ceremony was held outside, in a pavilion without walls. Everything felt very airy and spacious and light. There was no feeling of hurry, panic or feeling cramped. Things felt significant but not heavy or pressing down. I felt calm but invigorated, very peaceful and very alert. A paradox? 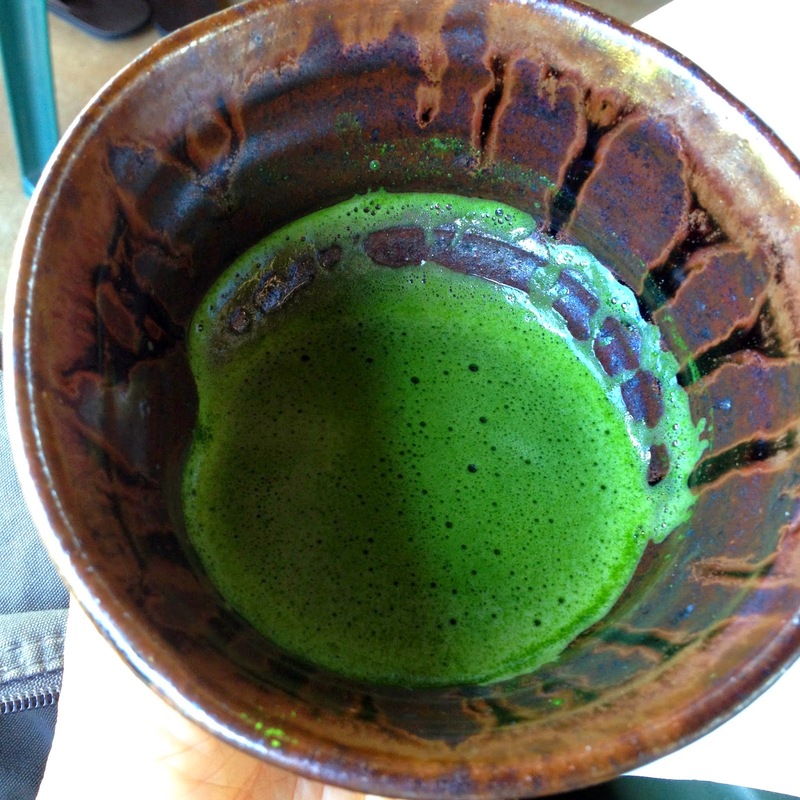 This is the matcha tea I was presented. It's a fairly vibrant shade of green, and it's frothy! It's thick like espresso, and has a bitter quality. I thought there would be more tea in the cup, but it's maybe 1/3 full. For someone who has never had this kind of tea before, it's an acquired taste and stronger than the green tea I'm used to. The man next to me really enjoyed his tea and requested seconds. From behind the Japanese screen, a woman in a Japanese kimono would appear from each side, walking to the next person in the audience, and presenting a handmade tea bowl with reverence. None of the tea bowls matched any other bowls. DH said one aspect of the tea ceremony is to appreciate the vessel that contains the tea, to look at it, feel it, and pause before drinking the tea. If you look at this tea bowl carefully, you'll see the left side is slightly indented for a thumb or finger. The snacks that were served during the tea ceremony. The piece of paper is folded in half, but not perfectly in half. DH says this is deliberate, in showing imperfection. The half moon sweet is hanabira mochi which encloses a spoonful of sweet bean paste and a piece of burdock root that has been cooked and sweetened, since burdock is not naturally sweet. 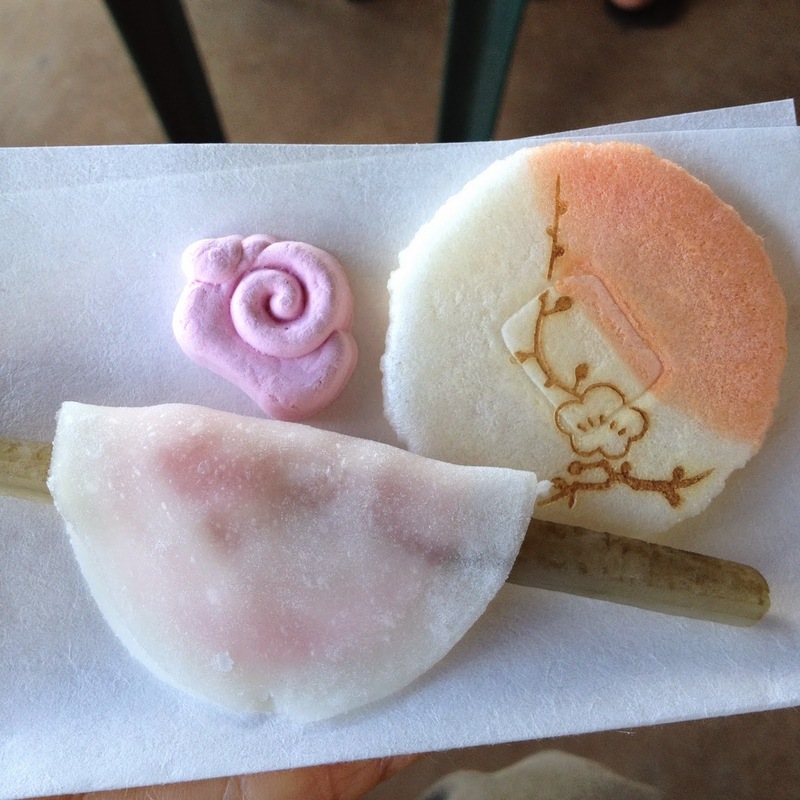 The rice cracker has an impression of what looks like a Japanese cherry blossom or sakura. The pink cloudlike confection symbolized a sheep, to introduce 2015, the Year of the Sheep. Each person was offered these foods and there were enough for people to have more if they wished. During the ceremony, one woman explained what was happening and afterwards, people were invited to come up to look at the tea implements more closely and to ask questions. The group also posed for photos. For anyone interested in learning about Japanese tea ceremonies, there is a group that practices weekly at the Rinzai Zen Mission, currently on Mondays. It’s open to anyone who is interested in learning, regardless of ethnicity. Please email me (mauijungalow (at) gmail (dot) com) if you'd like the contact information. Mahalo to Yukie and Koko for providing information about the ceremony. A bowl of folded Japanese cranes, good luck symbols. This post is linked to the StoryDam weekly blog hop. You may want to visit this link for some fun (and often free) February events on Maui. That sounds like a really interesting experience. Thanks for sharing! Your beautiful photos really add to the narrative. I'm rather peckish now, too, and those snacks look beautiful and tasty. Aloha Tui, I'm glad you enjoyed the photos. The presentation of the tea ceremony was very beautiful.